Enables monitoring of the programmable controller or motion controller, log data, collect alarm information, and changing setting values, etc., using familiar Excel® software. 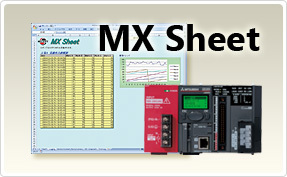 MX Sheet operation conditions can be set from Excel®. Therefore, a communication program is not required to communicate between programmable controller and Excel®. The device data in the programmable controller is monitored and logged real time before being written to Excel®. Recipe data can also be transferred to programmable controller directly from Excel®. The data displayed on Excel® is automatically saved or printed at the specified time or as requested by the programmable controller. Periodic reports and test result lists are generated automatically. Daily reports and monthly reports can be automatically saved and printed according to various conditions.